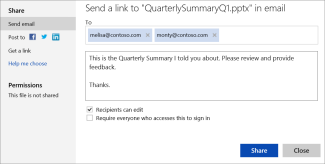 In PowerPoint Online, you can send a file as an attachment in Outlook.com or Outlook Web App in Office 365. The recipient will get a copy of the file, and if they want to edit it, they’ll have to save it with a new name. You can also send a link to your presentation that lives in the cloud. On the Insert tab, click File as attachments. 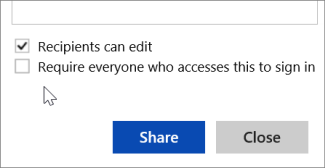 Go to your OneDrive folder, and then to the folder that contains the presentation you want to send. Double-click the file to attach it to the email. In the To box, add the email addresses of the people you want to send the attachment to, and then add a subject. In Office 365, at the top of the page, click Outlook . Enter your recipient’s email addresses and the subject, click Insert, and then click attachment. 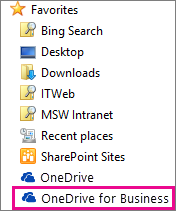 Open your OneDrive for your organization. Browse for the presentation file, and then click Open. Click the Share tab . Enter the email addresses of the people you want to send the link to, and then type a message. If you want them to be able to edit your presentation, check Recipients can edit. If you’re worried the email will be forwarded to people who you don’t want to see your presentation, check Require everyone who accesses this to sign in (to a Microsoft account).